It’s that time of year when it is simply de rigueur to think pink. Heart-shaped chocolates, cupcakes, biscuits and desserts about. Heck, even emails at work are festooned with cherubs, hearts and flowers to persuade us that getting on top of our administration is somehow wonderfully romantic (is isn’t). However, I’ve decided to depart from the usual Valentine treats (i.e. sweet and sugary) and instead to try something a little different. As an antidote to all those chocolates, this is just a simple salad to make us feel healthy during these cold, wintery days. And yes, obviously, it is in part hot pink. 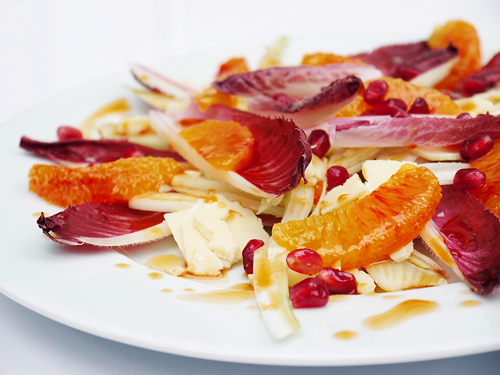 To make this salad, I’ve used ingredients for both colour as well as flavour. It would be easy just to walk around and throw everything that is red into a bowl and suggest it conveys the essence of romance, but I wanted to be more subtle than that. Most obviously, I’ve used red endive, which add a rich pink colour, but also have a little bitterness to them. What’s love if not occasionally bitter? 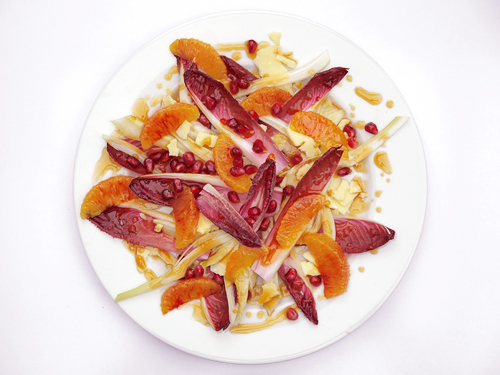 Then there are pomegranate seeds and segments of blood oranges. Don’t read too much into the “blood” part, but I wanted some fruit that would add sweetness, the oranges providing some citrussy tang and the pomegranate seeds some crunch. In all honestly, I must say that I was a little disappointed that these oranges were not, well, more “bloody” when I cut them open, but they did turn out to have very pretty orange and red mottling, which actually looked great on the plate. I also put in some aromatic fennel (I’ve been eating a lot of this recently) as well as some crumbled cheddar. I could say the cheese somehow symbolises strength and smoothness, but the reality is – strong cheddar is just brilliant with fennel, and there’s not too much more to it than that! I finished this off with a simple dressing of olive oil, honey and red wine vinegar, which again balance sweetness, sharpness and smoothness. Finally, the sauce gets a little kick in terms of flavour and colour by adding some oil from a jar of harissa paste. It ended up more orange than pink or red, but the effect was still great. So that’s really it! This salad is by turns sweet, bitter and sharp, so it has interesting tastes and textures as well as looking quite stunning. You can, of course, tweak the ingredients depending on what you have to hand and your own preferences, but I think the red quality from the endive and fruit is pretty much essential. Whatever you have planned for tomorrow – dinner à deux or a fun-filled evening with friends – have fun! 1. Break the endive into leaves, and cut each one into two lengthways. Peel the orange and cut into segments. Slice the fennel into very thin pieces. Slice the cheese and crumble. 2. 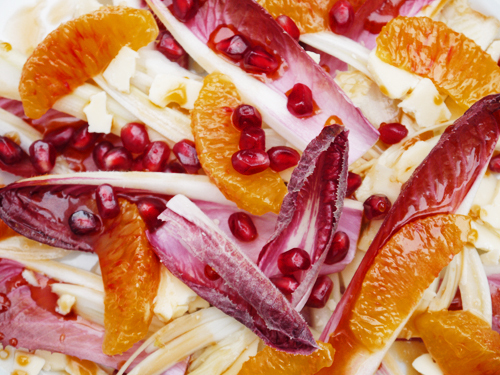 Build up the salad on two plates – start with the endives, then the fennel, then the oranges, then cheddar and then scatter over the pomegranate seeds. 3. Make the dressing – whisk everything until smooth, then drizzle over the salad. I am sitting on the sofa and can see sunlight streaming through the clouds. Might Spring be here? Endives are something I am very familiar with from my time living in Belgium, must usually seen baked. I have to admit, I am not a fan of the grey, sad witloof or chicon sitting in water when brought to the table. 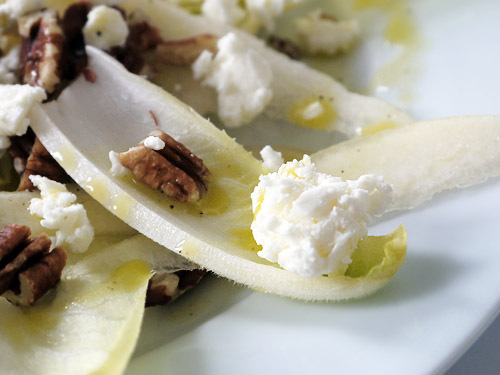 Maybe I will work out how to prepare baked endive one day, but for the time being, I like them raw and crisp, to add an interesting dimension to a salad. The white leaves, fringed with bright yellow-green also hint at Spring arriving. My research also revealed that they go by many names. I usually call them chicory, but that can be confused with the blue flower of the same name. Then I happened to see an episode of the dreadful Hell’s Kitchen USA, with everyone talking about en-dive (rhyming with hive). Maybe I’m just posh or wrong, but I thought it was pronounced like believe. I digress. The pears in the vegetable shop at this time of year actually work quite well here – they stay quite firm and have a little crunch, which makes the salad more interesting that using their riper – but softer – cousins in the middle of summer. The trick is to try and get them into thin, tapering slivers that look good on the plate. You can keep them pale and interesting by dropping them into acidulated water – that’s water with a squeeze of fresh lemon juice to you and me. As the for the nuts, I was fully planning to use walnuts, but realised that I didn’t actually have any. I did, however, have pecans. Walnuts are more of a nutty “savoury” flavour, but with the tang of the endive and the salty taste of the cheese, I figures that sweeter pecans could work. Well, they would have to work, as I had not checked I had everything at home before starting, and I was mid-recipe when I worked out that it was pecans-or-nothing. In the event, they worked, and worked very well. And the silver lining is that pecans are the less obvious addition than walnuts, and add an interesting flavour element to the salad. Playing fast-and-loose with the classics, eh? I loved this salad – interesting flavours, lots of texture, and a sharp simple vinaigrette with white wine vinegar and the last of my monocultural olive oil from holiday last year. Maybe time to start looking at a little trip too? Peel the pear. Cut into thin slices (removing any of the core or pips) and place the pieces in acidulated water (i.e. water, with a little lemon juice – this stops the pear turning brown). 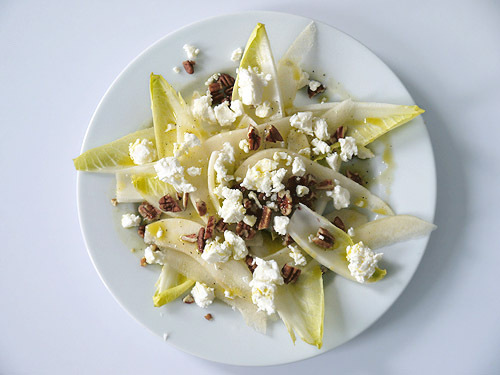 Separate the endive, and cut each leaf in two lengthways. Just before serving, drain the pear slices. 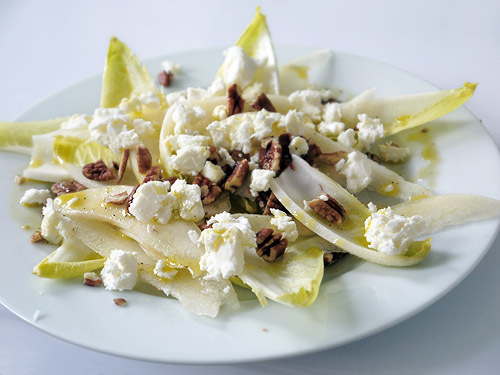 Arrange the endive, pear, feta and pecans on each plate, and add a little of the dressing. Add all the ingredients to a jam jar and shake vigorously until the dressing is smooth.